PAUL VAN DYK PRESENTS HIS 9th ARTIST ALBUM ‘MUSIC RESCUES ME’ IN NORTH AMERICA THIS FALL! In behind-the-scenes production for the greater part of a year, Paul van Dyk surprise-revealed this week that a new artist album – his ninth - is inbound this autumn. Signalling a newly galvanized creative stream from the electronic music legend, it will hit October 2018 - just 12 months after his wildly successful, critically embraced comeback LP, ‘From Then On’. Arriving under the appellation ‘Music Rescues Me’, it will develop and expand on the theme first set by the album’s vanguard (and namesake) single, a collaboration with Plumb. Part tribute to/part personal mediation on music’s seemingly limitless capacity to heal, restore and lift, it’s a subject that has rapt Paul to the greatest of degrees. 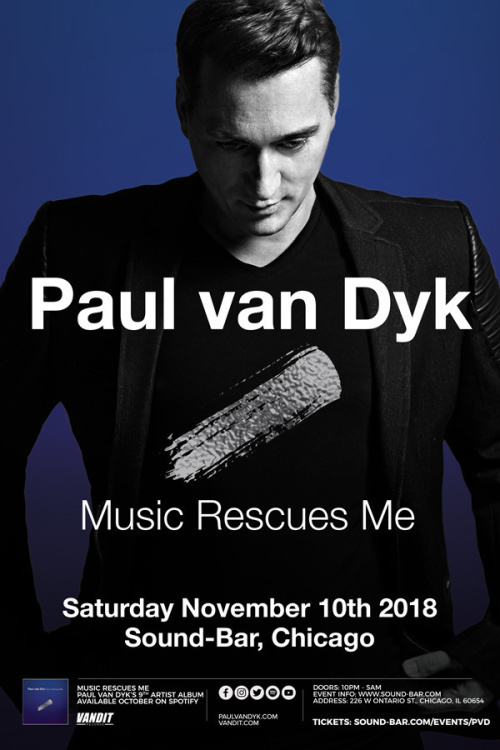 Allowing fans the clearest possible idea of ‘Music Rescues Me’, PvD unveils an 11-stop North America Tour to present the new music live and direct to the trance family. If you want to secure yourself a ticket to experience the ‘Music Rescues Me’s show, now’s the time to activate!